Preheat oven to 350 degrees. Grease a 9x9 baking dish. Set aside.2. In a bowl, mix together sliced peaches, brown sugar, lemon zest and juice, cornstarch, almond extract and cinnamon until combined. Pour mixture into the greased baking dish.3. In the bowl of a stand mixer fitted with the paddle attachment, whip together oat flour, sugar, baking powder and salt. Add cubed butter and mix until pea-sized granules are formed. Slowly whip in buttermilk until a ball of dough forms.4. Drop dollops of dough onto the peach mixture. Sprinkle with almonds. Bake 45-55 minutes or until peaches are tender and dough is lightly browned.5. 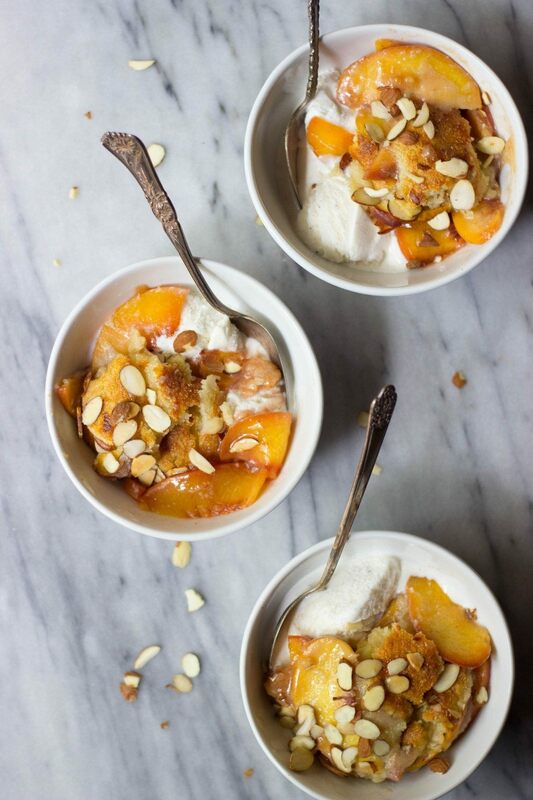 Serve cobbler with vanilla bean ice cream or frozen yogurt.